Before I get into the next leg of our adventure, I forgot a few things on my last post. First is our introduction to Pikachu! This little creature was one of our son Forrest’s favorite stuffed animals growing up. While we were going through boxes and totes last year downsizing we ran across Pikachu and now some 20 years later we have decided that he would be our mascot. Pikachu’s maiden adventure was crabbing in Coos Bay Oregon. Speaking of Antelope Island, we arrived at this location on Wednesday March 26th. This will be our home for the next 9 days. It will be nice to be parked in one location for that period of time and just relax. And……we made it in time, Jessica has not had her baby yet! The second thing I forgot in our last post was our first selfie! If you were to ask us a month ago how many selfies we had ever done, we would have laughed and said “none, we don’t do selfies!” Now, a few weeks later we have posted these two on the internet! Antelope Island is just that, an island just north of Salt Lake City on Salt Lake itself. There is a causeway of several miles that takes you out to the island itself with lots of wildlife. So far we have seen; antelope (who would'a thunk?! ), buffalo, mule deer, coyotes, rabbits and an assortment of birds. The island itself is huge with several peaks of 6,000+ feet. Barb and I climbed one on Thursday. You can't really tell how high we were in the picture but if you look close you can see our trailer to over Barb's left shoulder. Chuckers and Magpies are everywhere. These two posed for quite a while with the lake in the background. Can anyone identify this bird?????? trout about 17” each. Now that I know a few locations Barb and I will be able to hit the rivers in the next few weeks. One of my all-time favorite westerns…….It has been a roller coaster week and I have a lot of catching up to do. We arrived at AM Solar on Monday the 17th. We had a quick tour of the facility, went over our installation and spent the night in the back parking lot. The next day we pulled the rig into the shop, unhooked and headed out. We were to return on Thursday afternoon when the rig was done. We headed down to Grant Pass and spent the night there, the next day we headed over to Cave Junction to see Barb’s grandmother. What an amazing woman! At 93 she is still sharp as a tack, she heats her home with wood which she brings in everyday, drives a little Mazda pickup wherever she goes and can recall stories that Barb and I have long forgotten. Barb and I have often said that we don’t want to live into our 90’s, but if we could live like that, bring it on! Friday morning we went back to AM Solar and had a walk through with the tech. There is so much to learn about using this system! We focused on the basics and will have to learn the rest as we go. After hooking up and heading out we went over to Coos Bay on the Oregon coast. Barb had spent a lot of time camping in this area with the mom, dad and brother growing it, it was fun hearing her reminisce about their adventures and visit some of the areas that they went to. It is amazing to see how many places are still the same some 40 years later. We camped at Bastendorf Beach County Park. It is a very nice park with lots of large pines. Pulling up a pot full of crabs! Over the next few days we walked on the beach, enjoyed the campfire, went crabbing and clamming (more on the clamming later). Crabbing was a lot of fun, we rented crab pots ($4 each), got 3-day shell fish licenses ($11 each) and headed for the docks! We baited with both chicken and fish carcasses. You secure the bait to the crab pot, tie it off to the dock and throw it in. After waiting 15-20 minutes, you pull it up and see what you have. The most challenging part of the day was keeping the sea lions off your bait. We learned the hard way that sea lions love both chicken and fish. We lost most of our bait within the first hour and had to go get more. By the end of the second hour we were almost out again…. Stupid sea lions were killing us! A few times I would see the line move on our pot so I would start pulling it up only to have a 300# sea lion pulling back! You can guess who won that battle! Barb was a savior as one time when she went to take Daisy to shore for a potty break she came strolling back carrying a 4’ lingcod in each of her hands and a whole other bag of fish! Apparently she found the fish cleaning shack and talked a few fisherman out of there carcasses so we had plenty of bait now. We caught a ton of crabs but only about 1 in 50 was a keeper. At the end of the day we had about 20 keepers. We had noticed few days before we left Wisconsin that Bailey was not acting like herself. She was drinking constantly and had lost her appetite. As days went by there was no change and I took her to the vet while we were in Grants Pass. We had battery of tests done, x-rays, blood, urine but there was nothing definitive. At 11 years old she was showing signs of age but thought she still had a few years left. When we got to Coos Bay she started shaking more and stopped drinking. We knew the time was near but one of the hardest decisions is when to take her in. Barb said she will let us know when it is time and the next day she did just that, she could see it in her eyes. 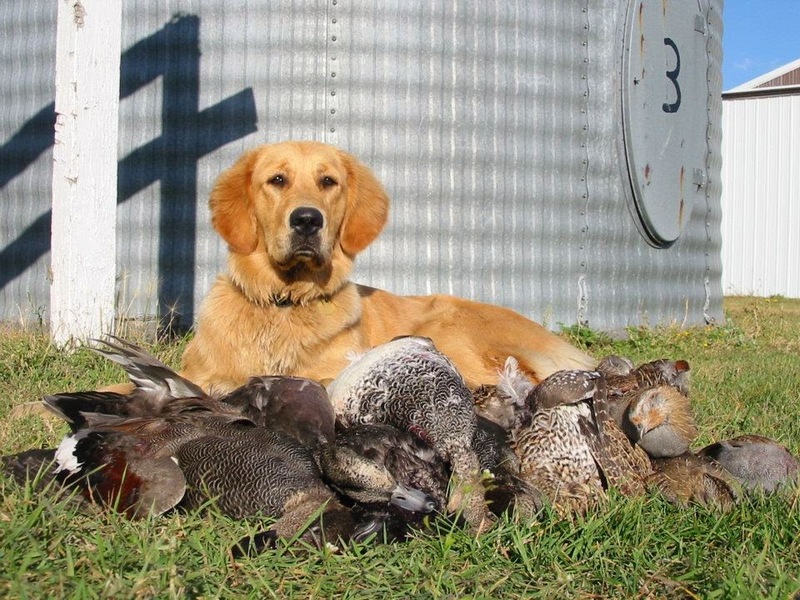 Bailey was the best dog I have ever had, loyal to a fault and my companion wherever I went. She will be dearly missed but we are thankful that we were able to spend as much time as we did with her during her last few days. It's a little muddy out there! Clam necks are just plain ugly! Now we are headed back to Salt Lake City to hopefully get there in time for Jessica’s baby. We talked to her this morning and it looks like we just might make it! After leaving the kids in Salt Lake. We drove west on 80 on our way to visit Barb’s relatives in Redding California. We spent the night in the Walmart parking lot in Susanville California and continued west on 395 and Hwy 44 through Lassen National Park. Lassen is an incredibly beautiful drive with lots of huge pine and cedar trees. We saw mule deer and turkeys while driving through the area. We were headed to Bear Mountain RV Park north of Redding for a few days. They are Passport America members and the cost is listed at $12.00 a night for full hook-ups. Following the Garmin GPS out of Lassen National Park the GPS had us take a left out of Palo Cedro and a right onto Intermountain Road, which indicated the park was 4 ½ miles ahead. So far so good right? The GPS is counting down the miles and we are getting closer. After 2 ½ miles the road turns from blacktop to gravel. No big deal, we are 2 miles away, take it slow and easy and we will be there in a few minutes. A ½ mile later the road narrows to the width of a driveway, we are starting to get a little concerned and we joke that this looks like another adventure but hey…… the GPS is counting down! At 1.6 miles to the park the road goes up a hill and as we crest the hill and look over the other side the road disappears into a washout and turns into a 4x4 trail! The GPS wanted us to go down this goat trail! I stop, turn off the truck and we just kind of stare at the road on front of us, knowing there is no way we can go forward. After a minute, we get out and walk back down the road to see if there is someplace we can turn around. A few hundred yards back there is a driveway, the problem is the “No Trespassing” signs and that the driveway takes a pretty severe drop downhill and once I get the rig pointed down the driveway, there is no guarantee I can back it up the hill and turn the corner to turn it around. I am going to give it a try! I back up to the driveway, look to my right and see llamas, sheep and a donkey staring at me thinking “What the $%#% is that guy doing? !” I turn down the driveway and as I ease the truck down the hill. The back of the truck is getting closer and closer to the nose of the trailer as the trailer has not started down the hill yet. The back of the truck actually touches the trailer before it follows the angle down the hill. Okay…… we are on the driveway facing downhill and I am fully committed. towards us. The meanest looking one (James) owns the property and the other menacing character was JT the neighbor. They, along with James’ wife Janna were some of the nicest people you would ever meet! They ask….”Were you following your Garmin?” I said no, we were just going for a drive and thought we would come down your driveway (not really). He says I am welcome to drive the rig up to their house and turn in around up there. So we walk the route, there are a couple of sketchy sections but I think we can pull it off. I go back and get the rig while they jockey some vehicles around so I can get turned around. 20 minutes later and a couple more tight spots we were turned around and back on the road and Barb and I, although frazzled, feel really blessed to have met such wonderful people. Following the directions James provided, we were at Bear Mountain RV Park 15 minutes later. We spent that day with Barb’s stepmom, Paula. We visited the Veterans Cemetery, Sundial Bridge and had a nice dinner at Logan Steakhouse. The following day, we visited with Paula along with Ron and Diana, Barb’s aunt and uncle. It was very nice to see them and have two days of much needed rest and visiting before our appointment at AM Solar on Monday! If you follow RV Dreams forums you would know what I mean by that title. But we are finally on the road and have received our diplomas (drivers licenses) in South Dakota! Sunday was filled with more packing. 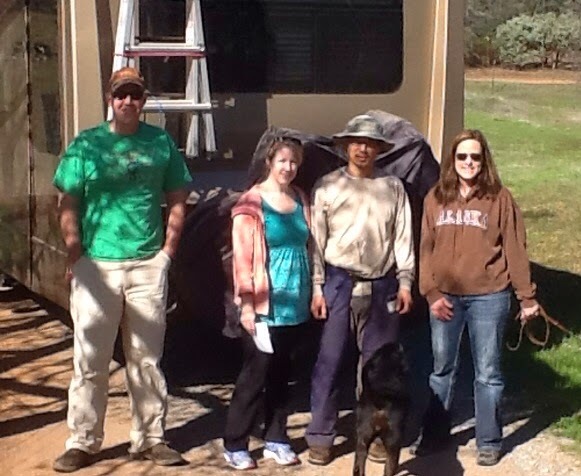 We thought we had packed ﻿﻿﻿﻿everything and just needed to grab our suitcases and the dogs and head over to the trailer. Well, we got packed up...one laundry basket full of bedding, one full of items from the fridge, our duffle bag and suit case, a cooler for the road plus three small totes we forgot about in the garage. Once it was all loaded up there was no room for the dogs! So it was over to the trailer to drop this load off (Thank you to Gloria for the awesome breakfast!) then back to pick up the dogs. I unloaded the truck and went back to get the dogs (30 minutes each way) while Barb put everything away. Word of advice.... When you finally get down to the bare minimum of what you think you need, cut it in half, then cut it in half again. We have way too much stuff! Barb managed to stuff everything away and we were on the road by noon headed for South Dakota. We stopped twice to double check things like when one of us would ask..."Did you latch the bikes?" (they weren't latched). Luckily Sioux Falls is only 5 hours from us so we pulled in about 6pm. We definitely need a check list for opening, closing and packing things u﻿p. 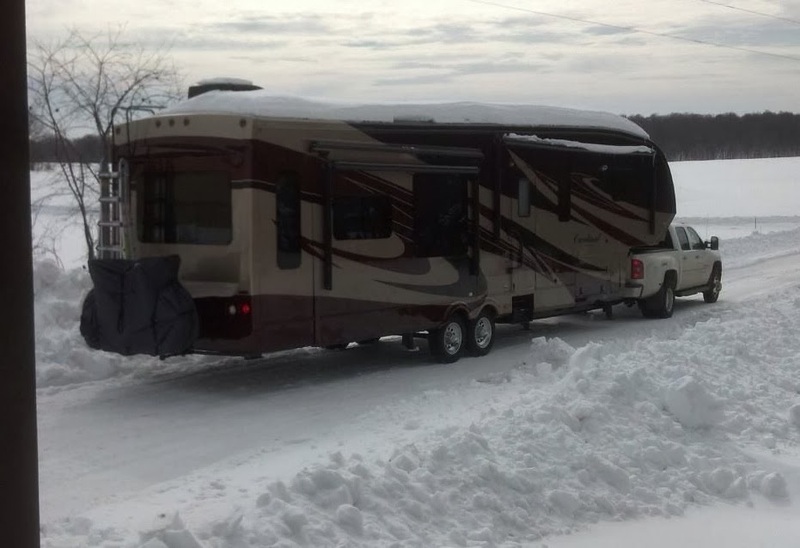 Although we have had a horse trailer with living quarters for years, this is our first RV so we are learning some things as we go. One minor catastrophe.....one of the overhead doors had opened and you cannot see it with the slides in. The problem is when we opened the slides the door got caught and took a little chip out of it. Could have been a lot worse and lesson learned. Lesson #2....take the keys out when you get out to check something. Daisy loves to push the lock button and just stare at you while you try to get in. Luckily Barb is well aware of this little trick from her years of hauling a horse trailer with Daisy and is constantly reminding me to grab the keys. I need to get an 3rd set as I know this is going to happen. In a previous post I listed our "must haves" and "nice to haves". I forgot one thing..... an additional mirror on the passenger side so Barb and see the back of the trailer while I am turning corners. More than once while turning corners I would try to look in the passenger side mirror only to see the back of Barb's head as she too was looking to make sure we were clearing the corner! Sioux Falls went seamlessly. We stopped at the mail forwarding service and picked up our mail and filled out our vehicle registration information. Then it was off to the DMV to get our drivers licenses. We filled out the paperwork, provided our passports, SS cards, 2 pieces of mail and our hotel receipt and within 20 minutes we had our drivers licenses and were South Dakota residents! This is when we could see the road! ﻿Then it was off to Salt Lake, it was a two day trip that was both beautiful and horrifying. If you have never driven Hwy 44 through the Missouri River area of South Dakota you have to do it. 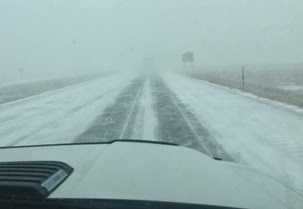 The horrifying part was between Cheyenne and Laramie Wyoming were we got caught in a snow storm ﻿﻿﻿﻿﻿﻿﻿﻿going over the mountains just east of Laramie. It was 6am and white out conditions, Barb was driving and could not see the centerline or the white line on the shoulder. Twice the truck and trailer slid sideways trying to maintain traction going up the grade. Stopping was not an option because once stopped you would never gain traction to get moving again. So she put it into 4WD and rode the rumble strip (at least we knew where we were on the road!) at 25mph for 10 miles to the Happy Jack rest area. We waited it out for a few hours and descended the 5% grade into Laramie. We made Salt Lake last night but still encountered several white-knuckle stretches across Wyoming where a snow storm would hit and the roads disappear! We will spend the next few days visiting with our kids and hopeful that is the last time we will be driving in snow for a long time! The day we thought would never arrive is finally here! Years of dreaming, planning, downsizing and luck have led us to this day. It is hard to believe really but we are leaving in two days and heading out. Today is Barb's last day of work! She is retiring after almost 24 years with the county. Although she is excited to start this new chapter, the week has been a stressful and emotional one for her. She really loved her job and the people she worked with. Saying goodbye to some dear friends over the past couple of weeks is really sinking in as we realize these are our last few days here. I took another load over to the trailer yesterday and was actually able to put the slides out and organize a little bit as it got up into the 20's! Tomorrow will be final packing, cleaning and taking everything over to the trailer. We are going to organize, hook up and get it out onto the driveway so Sunday morning we can hit the road bright and early! First stop.......South Dakota to establish residency, getting our drivers licenses and registering our vehicles. Then it is off to Salt Lake for a quick 2 day visit with our kids and drop off some totes for storage before we head to the Oregon coast. Our plan is to be back in Salt Lake the first week of April when our daughter Jessica is due with her second child. The picture in my previous post is Jessica 5 weeks from her due date. We had a hard time believing that she has 5 weeks left. Well she called recently telling us that she just had a doctor appointment and things might happen quicker than expected! Does not look like she is going to make her April 3rd due date and commitments on the coast will keep us there until the last week of March. With luck we will make it back in time for the birth but it looks like we are cutting it close!